Steampunk Fashion Guide: New Event: Cirque du Soleil's KURIOS in Winnipeg, Canada! New Event: Cirque du Soleil's KURIOS in Winnipeg, Canada! A new event has been added to the 2017 calendar! 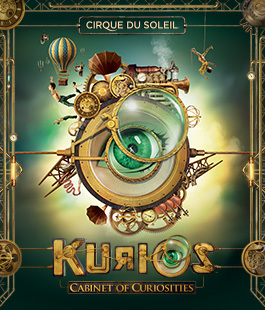 Cirque du Soleil's critically acclaimed Steampunk masterpiece, KURIOS, is coming to Winnipeg! If you're looking for tour dates for the other cities on the 2017 KURIOS tour (Dallas, Houston, Portland, Vancouver) they have already been added to the event calendar.